Having arrived back at their bases after the two American races, the teams had time to regroup and conduct testing before the start of the traditional European mid-season calendar. This phase of the season started with the French GP at Magny Cours. The French track is a conventional blend of fast and slow corners with reasonable straights. As a result, the track rewards the cars with better aerodynamics and tyre management. Where the previous three races have been stop/start in nature, the French track gave the teams the faster corners to run more downforce and challenge their tyres. As with any track, Magny Cours has its idiosyncrasies - the surface is flat and bump-less. This provides little grip when cold and early in the weekend before the rubber is laid down. As a result, the track develops through the weekend and can change quickly; even during a session or stint should the sun be masked behind clouds. Notwithstanding the unusual surface, the weekend saw Ferrari with an advantage for the first time since Barcelona. This shift in pace may give some clues as to why McLaren have been dominant over the past few races. At Barcelona, Ferrari introduced aero and suspension modifications to ease the load on the tyres with some success, as Massa won the race. Then Ferrari struggled with grip for three races until France. One conclusion could be that the Barcelona upgrade was too successful from a tyre perspective. Barcelona is tough on rubber, and the upgrade put Ferrari's tyres in the right operating window. Then, the slower corners at Monaco, Montreal and Indy saw Ferrari's tyres drop out of their zone. In the races the team seemed to have the pace after the first stint, but initial speed on new tyres was poor. This affected qualifying and opening lap performance. As these tracks had few fast corners to bring tyres up to temperature during a lap, the trips to France and Silverstone, with their fast turns, returns Ferrari to their more favoured operating conditions. Thus, we can expect a more closely-fought series of races leading to the next unconventional tracks at Hungary and Monza. Detailed revisions were introduced by Ferrari throughout the car, the most obvious being the cockpit fins and a revised front wing. The fins are the largest and most flamboyant yet. They mount to the shoulder of the monocoque and reach out and backwards towards the cockpit opening. 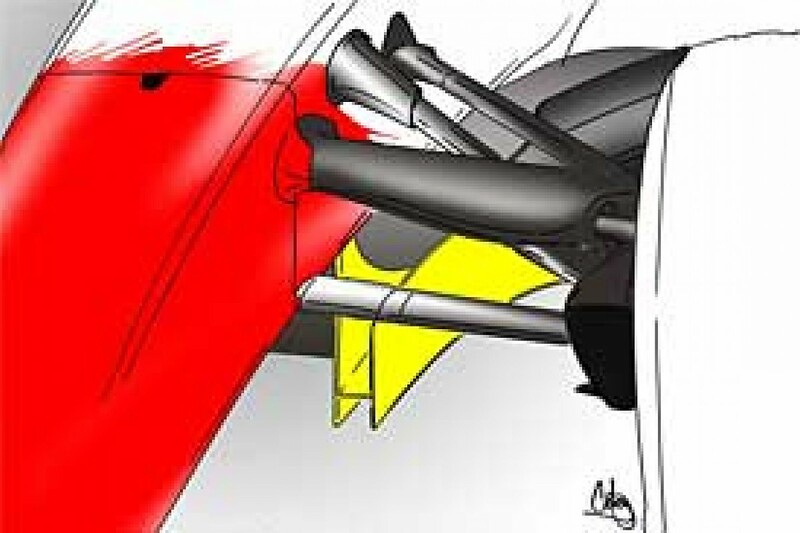 Often, these devices are used to create both downforce and to calm the flow over the upper section of the sidepods. 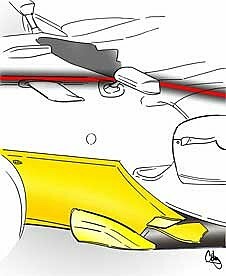 Ferrari's devices are noticeably sharper than other teams' solutions and may create a vortex to interact with the mirrors and pod wings. Present at the Silverstone test were the controversial front wheel fairings. These fairings remains static while the wheel around them spins, made possible by the wheel nut being attached to the fairing by a bearing. Both the front hub and wheel gun are unique to this set-up. Despite the fastest time of the three-day Silverstone test being set by Massa with the devices, they were not present for the French race. Notably, the cars made much better starts than the McLaren at Magny Cours, raising suggestions the team have done some work on the launch systems. In testing, McLaren ran new front and rear wings. These were not raced at Magny Cours, but the team did also try out a revised bargeboard. The new bargeboard retains the approximate size and placement of the old design, but the rear edge of the board now has an extra large curve vane. Above this new vane, the usual flip up is retained but the board is now cut away to create a notch beneath the flip-up. 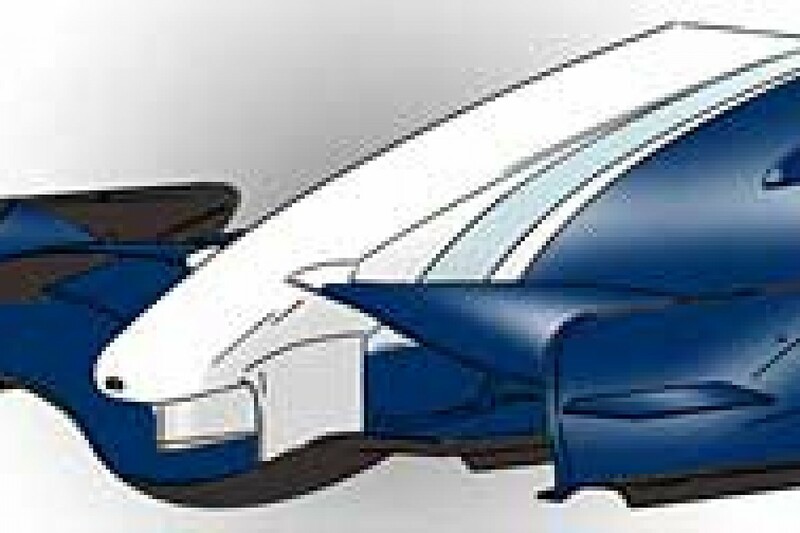 Both of these developments aim to alter the way the air flows to the rear of the car, affecting the flow both under and over the floor to improve the function of the diffuser. The test wings ran at the Silverstone test included a Ferrari-like rear wing, with two noticeable dips in the profile across the wing, while the front wing appeared to be a development of their usual three element front wing. Toyota brought a several updates to the car. The taller BMW-like engine cover spine was the obvious change, but the bargeboards were also a noticeable step for the team. The taller engine cover has been adopted by many teams and its effect is to stabilise the rear of the car and also improve flow to the rear wing when the car slides. Although new, the bargeboard mounts maintain a similar philosophy to the old design, with small double-layer vanes in amongst the front suspension. These have now progressed to having both of the vanes much taller; the usually small inner pair are now extended vertically to form the mounting the chassis. Other changes noted were a small fin on the rear of the front brake duct scoop. This is matched to the usual smaller fin-like inlet on the front of the brake duct. Having tested privately in Jerez with Super Aguri, Honda brought their second phase of upgrades to the RA107 in attempt to recoup the performance lost over the off-season with the change to Bridgestone tyres. Externally, the main changes are the return of sidepod winglets. The original complex multi-tier winglets were dropped before the car raced. The new set-up uses a long winglet mounted close to the chimney. Now, Honda have chosen to go for a simpler design, where the outer tunnels merge directly with the walls of the taller central tunnel. More significant changes are under and around the rear of the car, which sports revised bargeboards and a new diffuser. The diffuser change goes away from Honda's established design in this area, where a small extra channel was created in between the central and outer tunnels. This extra channel had also been adopted by Ferrari, Williams and McLaren. The changes certainly improved Honda's form, with the team's first point of the year. 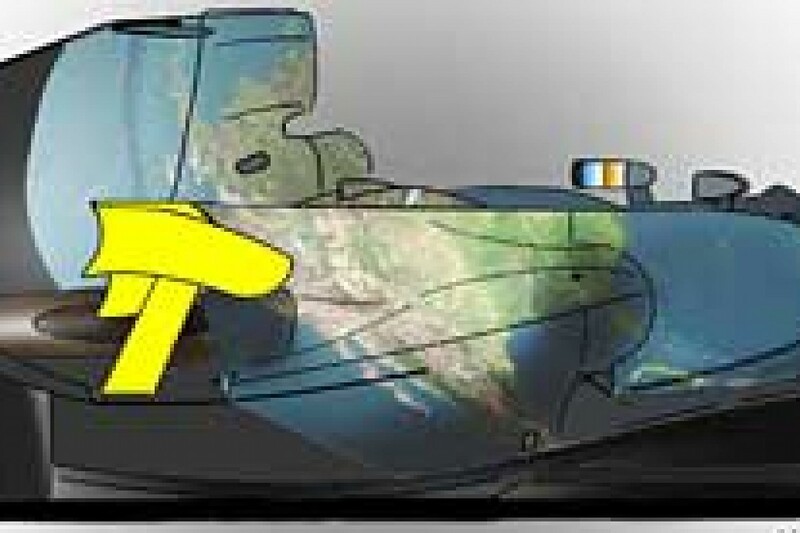 Having successfully tested a new front wing at Silverstone, Williams raced their new nose set-up. This consists of a revised lower wing and flap, but the more visible change is the bi-plane wing above the main wing. This is now flatter, with the wing meeting the nose cone horizontally, rather than twisting down to meet the nose as before.